Yes, I’ve finally put my foot down on this. I’ve been wanting to get my braces done like eons ago and at last, I’m one step closer to achieving my goal – a million dollar smile. Or at least, a decent smile which I can proudly show my teeth. In my previous post, I’ve talked about how I have a class III jaw type and based on my research, most class III jaws require jaw surgery, which I know would guarantee a 100% success rate in order to push back my lower jaw and bring my upper jaw forward. Occlusion refers to the alignment of teeth and the way that the upper and lower teeth fit together (i.e. your ‘bite’).Malocclusion means the teeth are not aligned properly. Ideally, all upper teeth would fit slightly over the lower teeth. The points on the surface of the molars would fit the grooves of the opposite molar. Class 1 malocclusion, which is the most common, occurs when the bite is normal, but the upper teeth slightly overlap the lower teeth. Class 2 malocclusion, known as an overbite, occurs when the upper jaw and teeth severely overlap the bottom jaw and teeth. Class 3 malocclusion, known as an underbite, occurs when the lower jaw protrudes or juts forward, causing the lower jaw and teeth to overlap the upper jaw and teeth. 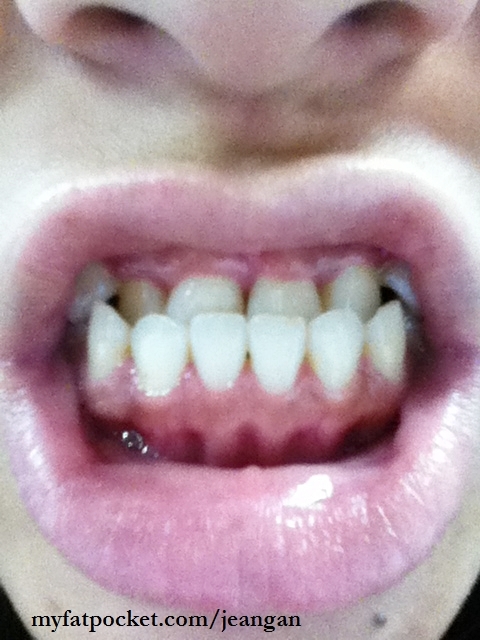 Which I consider to be quite a severe underbite (class III) since my bottom teeth is covering about half of my top teeth, my orthodontist had to place the braces in such a way that it wouldn’t disturb my natural normal bite. My orthodontist is so far still acceptable in terms of his professionalism from the point of view of a customer/patient. However, I wasted 18$ cabbing down from work in order to rush to the dental clinic Q&M Dental Clinic at Bedok all for nothing! He was 1h30m LATE and I was really furious because I lacked sleep the night before and was starving. Thank goodness the nurse/receptionist advised me to have my dinner first since he’s late. My appt was scheduled at 6.30pm, I reached at about 6.40pm and at 7pm, he called to inform the receptionist that he’s gonna be late. So being a hungry ghost I was, I gobbled down a lonely dinner on my own at a coffeeshop nearby and walked a little around the interchange before heading back to the clinic again. I went back at 7.30pm since the receptionist told me that he would require another 20-30mins when it was at 7pm, but hell no… HE WAS STILL LATE!!! And there were other patients waiting too. Nevertheless, he arrived in drenched uniform because it was raining damn heavily and he was thus caught in the traffic. The orthodontist mentioned that the current position of the braces is not the most ideal one but because I’ve overcrowding on the top set as well as a slight one on my bottom set (he didn’t mention this during the consultation previously and only informed me last night, which caught me by surprise because I’d always thought my bottom set was straight and looking good, which at least consoled me a little), and hence, he had to position them that way. I didn’t extract any tooth for the braces to be done though. The plan goes like this, to put up the braces for the top set to expand the upper jaw first, elastic bands to be placed at the sides of the mouth and then proceed to my bottom set for braces. But the 2nd and 3rd stage could be reversed depending on the progress. Will have to go back for a re-visitation 4 weeks from now at the end of the month. I did make an informed decision since it’s gonna be a 2-year commitment and I do know that it’s not gonna guarantee a 100% success rate for my teeth to jump the bite. So I’m actually taking a gamble here. But as mentioned in my previous post, the orthodontist did mention that I may stand a good chance in jumping the bite. Once that is achieved, it will perpetually remain that way since my top set would prevent my bottom set from overlapping it again. It’s somewhat ‘locked’ then. So ask me if it’s painful? I would only say that putting them on isn’t painful and on that day itself, it won’t hurt. 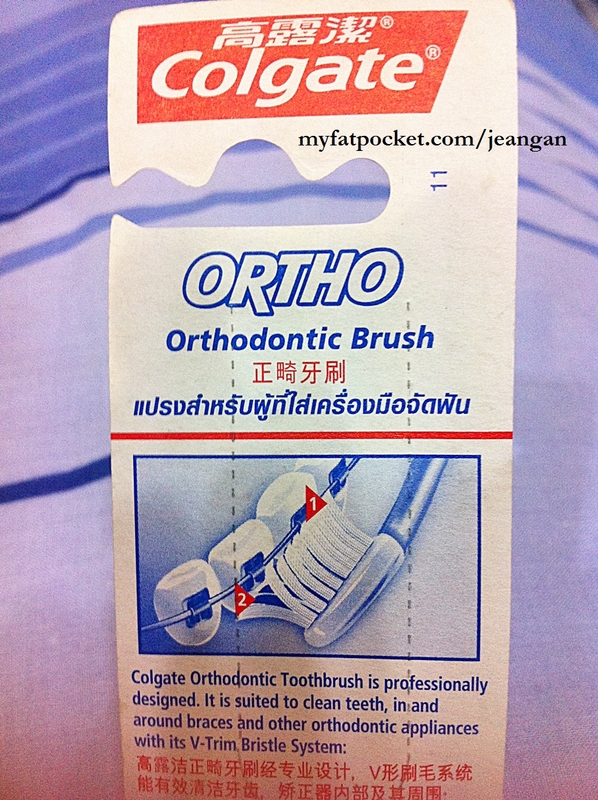 Come the next morning which my orthodontist revealed, it would and it’s true. I’m feeling as if I’ve perpetual teeth ache and note the plurality won’t you? Biting and chewing is thus difficult. It’s not exactly a nightmarish pain but it does cause discomfort. So I guess I’ll have to stuff myself with mashed potatoes or soft food again, which I’d struggled during the period I had all 4 of my wisdom teeth extracted at one go, which you can read in this previous post of mine. 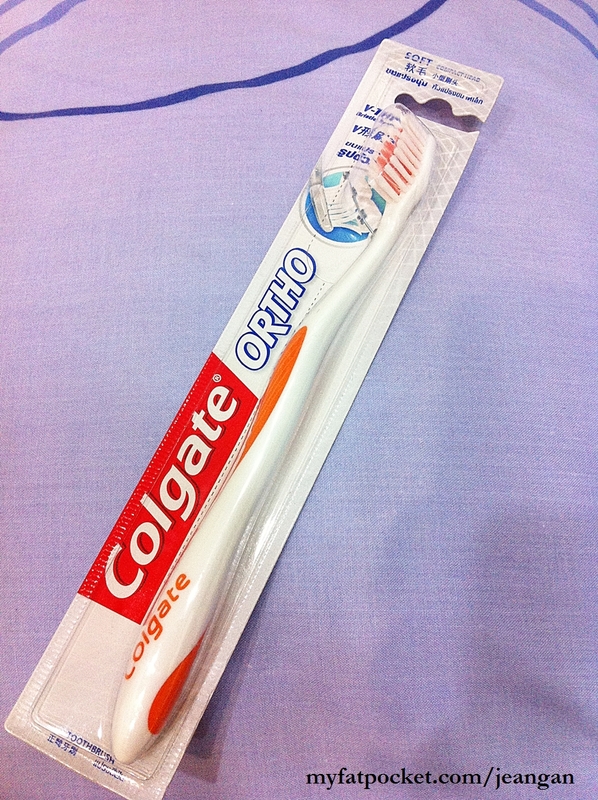 Payment-wise, I was charged $4.2k which includes the regular visits and the braces, and I was advised to purchase a special tooth brush made for braces wearers, which costs $5. I was also told that come the day when my braces get removed, I would have to put on the retainers to keep them aligned and in ‘shape’ and this would cost $300 for both top and bottom set. So all in all, it costs about $4.5k excluding GST charges (which is not cheap either). Oh and in case if you guys are wondering, due to my class III malocclusion, I’m not suitable to wear invisalign, which is usually for class I minor cases. Well, although I guess it can go both way – good and bad. Good – Save lots of $$$. I was quoted 7k for invisalign. Need not remove and put it back each time I have my meals. Bad – Stuck with ugly looking metal braces for 2 years. I didn’t choose ceramics as well cause I’d thought it just makes no difference and you pay the extra $$ unnecessarily anyway. Oh, and after putting the braces, my mouth and teeth naturally fixes itself edge to edge whenever I close my mouth. I guess it’s because of the foreign objects on my top teeth that my brain sends an auto signal to avoid touching and grinding it. And it’s also because I can position my teeth edge to edge that gave the doctor higher confidence to inform me of my possible high chances of jumping the bite, since there is space to adjust the jaw structure accordingly. Food-wise, I was told to avoid sugary, fizzy drinks… to have my food cut into smaller pieces especially for hard food. To avoid sweets and gummy bears. Have no idea why the orthodontist specifically told me ‘gummy bears’. I think I’ve a ‘gummy bear eater’ face that’s why? Told bf about it and he laughed, lol. ;p But yes, I really love gummy bears! Or anything gummy like Haribo sweets too! 😀 Plus, it comes in super handy whenever I’m angry! I can just chew and bite and tear it in my mouth like nobody’s biz and vent all my anger, frustration and sadness all at once! Yes, I’m full of angst. 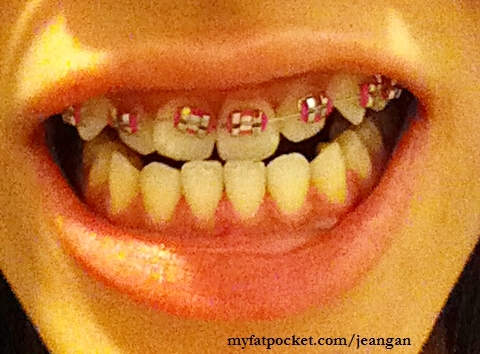 And having braces on just makes me feel like not eating (YAY CAN LOSE WEIGHT?! ), not smiling and not talking at all. So yes, I’m gonna be a skinny unfriendly quiet girl soon.